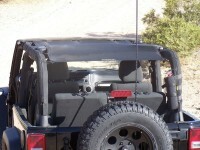 It is obvious that a huge part of the great fun of owning a Jeep is the open-top wheeling that goes with the vehicle. However, it does not take long to realize that open-top fun comes with the bonus of a free sunburn, especially when you live in a state like Arizona, where it’s sunny almost every day. When you own a Jeep with a hardtop and you wanna loose it for a while and enjoy the open air, you have few options. You can buy a soft top and only use it when it rains, you can get a Bikini top or a mesh top. 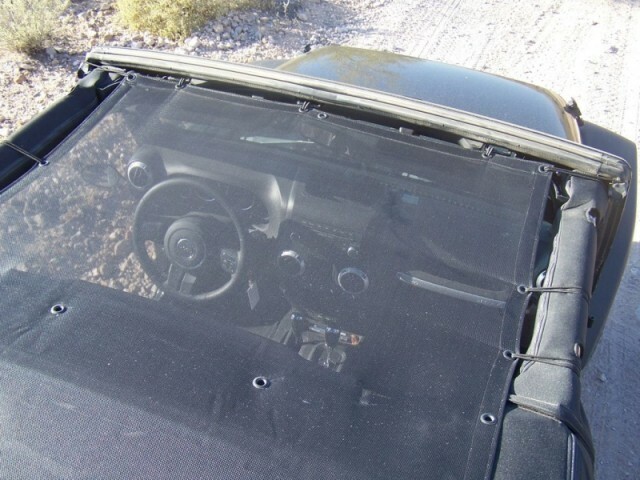 Soft top and bikini top are good options, but they are really thick and once put on, they block all the sun, breeze and the view of the sky. They will protect you from the sun rays very well though. They are pretty expensive, and with bikini tops you have to remember to buy a separate windshield channel, which is as much as the top itself. As I was trying to decide which option would be the best one for me, I accidentally came across few pictures of another jeeper, who had a mesh top intalled and it looked really good on his jeep. I also liked that it seemed like a really easy install with apparently few bungy cords. He seemed very comfortable with a nice amount of shade inside his jeep. After talking to him and getting his feedback, I decided to order the mesh top for myself. It is made in Orlando by SpiderWebShade. 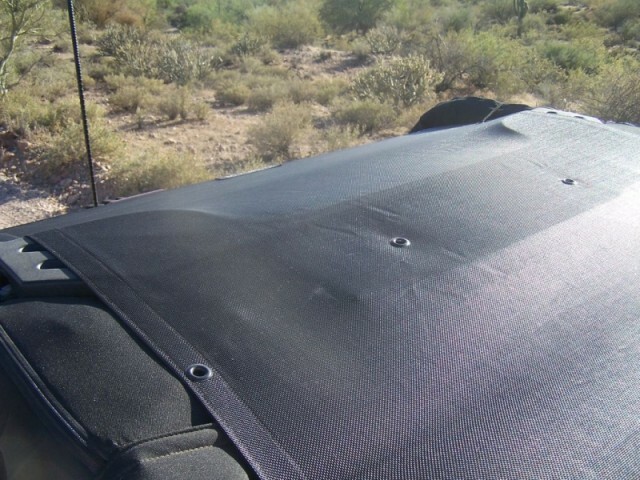 Spiderwebshade virtually reinvented the Bikini Top for the Jeep. Unlike a conventional Bikini Top, the Spiderwebshade is made of a mesh material that allows just the right amount of both air and sunlight into your rig while a convention Bikini blocks everything. The best part in my opinion is the fact that the Spiderwebshade top only needs to be installed once and there is no separate windshield channel. The top installs with “SpiderBalls”, basically a looped bungee cord with a ball on the end that the bungee loops around your roll bar and then around the ball. 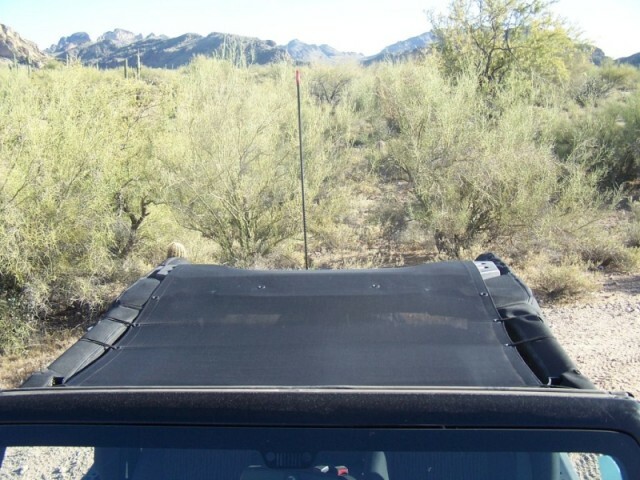 This makes for an easy and quick installation and also allows you to leave it on when you put your soft- or hardtop back on. You can get the top from www.spiderwebshade.com and there are many different options available. 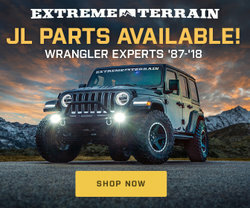 There are one to four-piece Jeep Wrangler and Jeep JK mesh tops that fit all Jeep Wrangler YJ 1987-1995, Jeep Wrangler TJ 1997-2006, Jeep JK 2D and 4D Unlimited models 2007- 2012. All tops are Made In America, shipping is $11.99 and you get the top in just few days. They offer two mesh options to suit the needs of any Jeeper. You can get the UltraMesh or TrailMesh. The first one provides for a bit more stretch than the second option. On the other hand TrailMesh is their newest and most durable material yet, and this one comes with a 5 year warranty.